1. Describe yourself in 7 words. Enthusiastic, pensive, curious, a “religious fanatic” (to quote my non-fanatic relatives), anxious, organized. Good heavens, what doesn’t? I’m a mom. I haven’t slept well since before my firstborn, lol. Well, maybe that week I was on narcotics for back pain, that was some deep sleep…..
3. Who would I like to be? 4. What am I wearing now? Blue polo shirt, sweat pants. I’m going to go to the church to help clean the building today. I’m also very proud to say that I am wearing TWO socks with no holes in them!! (I am terrible about buying new clothes for myself so I usually wear them out first. And Livvy has lately been snagging my feet as I walk by, causing my socks to develop holes, ugh). 6. The best and worst of blogging. Best: building and designing the template; writing those first new posts; making new friends; when friends leave me loads and loads of comments (hint hint). Worst: PageRank and Google’s underhanded control of the what we see on the Internet; the competition; technical problems; spammers and trolls. 7. The last website I visited. Well, it was probably Photobucket to get that Tag image uploaded… before that, it was Karen’s blog to see the questions…. before that it was.. WKTV News. 8. What is the one thing I would change about myself? I wish I tended to see the glass more “full” than “empty.” I was trained very early on to always be cautious, always be suspicious, and while this is OK for a soldier or in a pogrom, I tend to miss out on the joys of life. 9. Slankets: yes or no? 10. 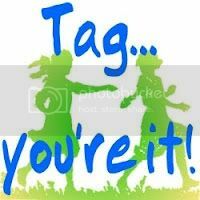 Tell us something about the person that tagged you. Karen is such a sincere, straightforward, happy person. That’s probably why I like her so much. She’s easy to be friends with. She likes to “scratch below the surface of things.” I also like her “Things I Learned This Week” posts because I also like to learn new things. So now comes the part where I tag others (insert creepy organ music)… I hesitate to directly tag folks just because some bloggers have a decidedly strong aversion to memes and because so many of my pals have been tagged previously. So if you are reading this and you have not done this post, consider yourself tagged! How’s that for the easy way out, huh? Let me know if you play because I would love to read your answers! Happy National Hairball Awareness Day! And even when I take my percocets I still don’t get any sleep at night but my back doesn’t hurt so its a trade off I guess even though I never sleep nights. Good answers, although I cringe when I hear that you don’t buy yourself clothes. I did that for years. Now….well…it’s my turn to shine a bit. 🙂 I think you should at least splurge on some new socks, pally!